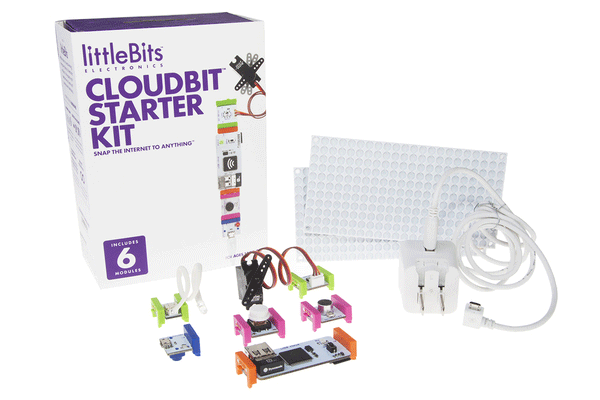 The littleBits Cloudbit Starter Kit includes the cloudBit plus 5 other favourite prototyping modules; everything you need to create internet-connected devices in seconds. Recreate the most popular smart devices, use littleBits to prototype the next billion dollar idea, or invent a project that solves your own, unique problem. Perfect for hackers, designers, makers and tinkerers of all levels-without the programming, soldering and wiring normally required. We’ve included 6 of our favourite modules to keep you inventing for hours. The bundle also includes a USB wall adapter—perfect for permanent installations!